Photo by: LuminumThe founders of Fokus Optik followed their vision to build a chain of optics stores whose quality of services and prices corresponded to similar firms in the west. Their success is clearly visible. 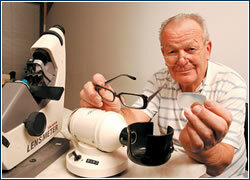 IN 1991 Jiří Los and Vilém Richter, friends and colleagues who had worked many years as opticians, ushered into being Fokus Optik. The third partner, Jaromír Novotný, joined them about two years later. “We started with an eight-million-crown loan from Česká spořitelna,” recalls Los, today the firm’s general director. They bought their first shops at auctions during the small privatization, then taking five hard years to repay the loan. “Sometimes we went home without pay, because there simply wasn’t anything left for us. We had to buy goods and pay our employees. Our wives sustained us, and we drove old cars,” laughs Los, noting that this is the basic lesson of doing business – curtailing one’s own consumption. In that wild period, when many entrepreneurs with megalomaniacal ideas used bank loans to first buy powerful cars and imposing houses, resulting in their firms’ bankruptcies, their behavior was unusual. Although uncertainty was high at the time, it eventually paid off. “In order to generate sufficient turnover we had to open more and more shops,” Los explains. “Fortunately there was very little competition then, so each shop turned a profit after the first month.” The rapid development continued until 1996, when the repayment of the loan marked a breakthrough – the situation quieted down, and the effort of expansion was replaced by making the firm’s processes more efficient and strengthening the market position and image. Fokus Optik signed an exclusive contract with a maker of luxury brand optics, and invested in software, advertising, and its own headquarters. From the very beginning the owners were clear that Fokus Optik will aim to offer the broadest line of goods to the largest number of people possible. “With globalization everywhere, the future is in chains,” Los states with conviction. To which Novotný adds: “The goal was to have so many shops we would serve as wholesaler to ourselves.” Supplying a large number of shops meant buying large quantities at lower prices of both, inexpensive and luxury goods alike. “In Asia you can buy from manufacturers for less, but only in lots of at least 200 items,” Los points out. 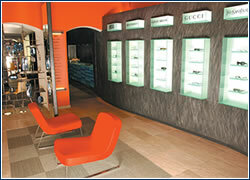 In Fokus shops customers can find goods in all price categories from various manufacturers, from the cheapest through luxury brand glasses such as Christian Dior, Gucci, Valentino, Yves Saint-Laurent, and Armani, which all belong under the Italian firm Sáfilo, whose products Fokus Optik exclusively imports to the Czech Republic. For greater effectiveness, the company also decided to switch from a system with workshops in the stores (common practice at the time) to a central factory, investing in first-rate, computer-controlled grinding machines whose precision outweights their high cost. This not only improved the quality of the final products, but it also improved work productivity. “The atmosphere in shops quieted down and the staff could pay more attention to the customers,” Richter says. 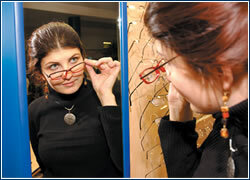 “Additionally, this allowed us to make use of what our personnel were really good at – one person’s a better optician, another’s a better salesperson.” Experts offering comprehensive service is now a matter of course in the shops: they advise with choosing frames and lenses, examine eyes, or apply contact lenses. 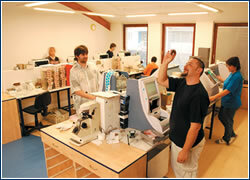 Technology also benefited other company activities. In the mid-90s, when the expansion exceeded a certain point, a need arose to interconnect the individual shops and the warehouse with computers to ensure a smooth flow of goods and internal information. 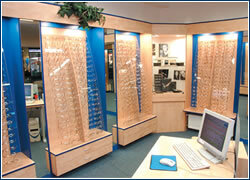 But at the time, no software for selling optics existed, so the firm had to create its own. That software’s effectiveness was proven when its creator launched a modified version for the general market, which sold quite well. Another efficient IT tool tailor-made for Fokus Optik is special software for pricing goods by the so-called parametrical method. In simple terms, a price committee comprising experts from several shops rates purchased samples of glasses, and from that rating, the program determines the optimal retail prices. Until the mid-90s advertising was also under-exploited by Fokus Optik. The firm’s first truly large campaign was for high-quality sunglasses in 1996. “We sank millions into it, and the investment was returned in three years,” recalls Los. Today Fokus Optik spends roughly CZK 10 million a year on advertising, concentrating on product and image promotion in its shops, local and nationwide media like Mladá fronta Dnes, Právo, Blesk, and the radio. It also uses direct mailings, and discount offers. A special promotional activity is the Fokus Optik Sun Beach Tour – a beach volleyball, mixed pairs tournament that takes place throughout the republic. This particular sport is ideal for the promotion of sunglasses. 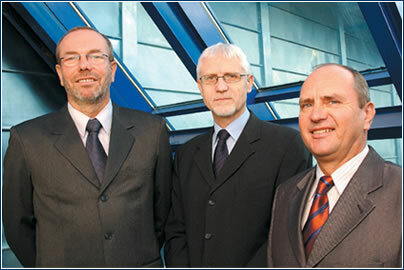 The Fokus Optik group also includes Kuk & Hop, s.r.o. 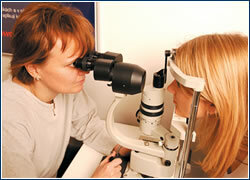 – a firm with facilities for correcting the vision of cross-eyed children without surgery. “This firm was the idea of MUDr. Jan Vondráček, and we inherited it with the building we purchased for our headquarters,” explains co-owner Jiří Los. 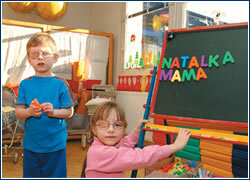 The building, in Kobylisy, Prague 8, formerly housed a kindergarten where this treatment was provided for pre-schoolers using MUDr. Vondráček’s method of eye exercises, which has a 70% success rate. “It doesn’t turn a profit, as it’s rather an act of mercy,” Los says. In the last year the firm joined the Renome loyalty program. “It’s the second largest loyalty program in Europe, and it’s not bound to one general partner, but to equal partners,” Novotný explains. Aimed mainly at women, Renome was established years ago by the owner of Baťa, and along with Fokus Optik there are three other participants: Droxi, Klenoty, and Reserved. One side of the club card shows information on the client that helps vendors to meet their needs, and on the other side points are collected which the client can spend with any of the partners. “We expect a lot from this program in terms of knowing and keeping clients, with the option of rewarding the most loyal,” Los says.